Earlier this year, Billy Mitchell – one of the top Donkey Kong players – had his high scores heavily scrutinized. The primary issue was that Mitchell was thought to have achieved his scores on an emulator instead of real arcade hardware. Since the initial accusations and after some of his scores were removed, Mitchell has been looking to clear his name. He came a long way in doing so yesterday after live streaming himself playing Donkey Kong and matching scores that were investigated in the past. Billy Mitchell has been the focus of much scrutiny this week. Twin Galaxies determined that Mitchell’s high scores achieved in Donkey Kong were not earned on natural arcade hardware, but rather through emulation which leaves the door open to cheating. Mitchell’s scores were thrown out, and he was banned from submitting future scores in the future. Guinness World Records is also wiping the slate clean. 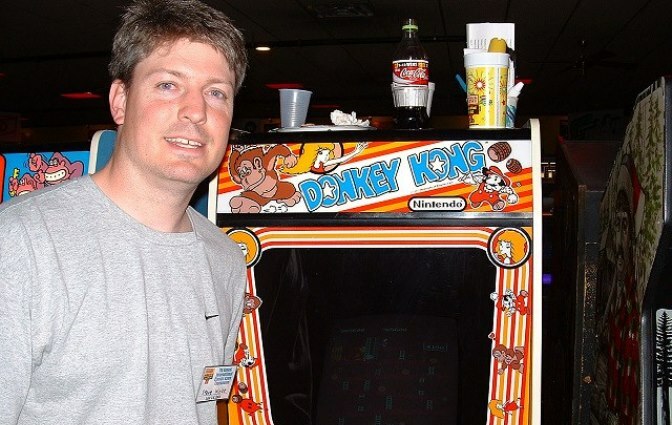 If there’s one person who has something to gain from Billy Mitchell’s high scores in Donkey Kong having been thrown out, it would be Steve Wiebe. As depicted in the 2007 documentary, The King of Kong, Wiebe had been attempting to overtake Mitchell’s score at the time. 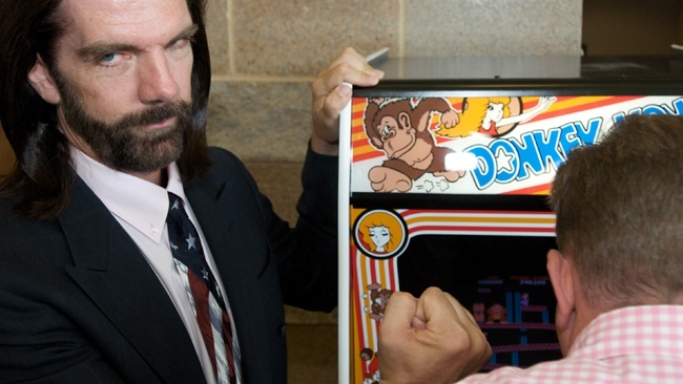 Yesterday, Twin Galaxies delivered its verdict surrounding Billy Mitchell. It was ultimately decided to have Mitchell’s scores in Donkey Kong and other games removed. Moreover, he will no longer be able to submit scores to Twin Galaxies. In line with Twin Galaxies’ decision, Guinness World Records is also removing Mitchell’s Donkey Kong scores along with his records for Pac-Man. This is due to the belief that Mitchell achieved his scores through emulation software and was not earned on an arcade machine. 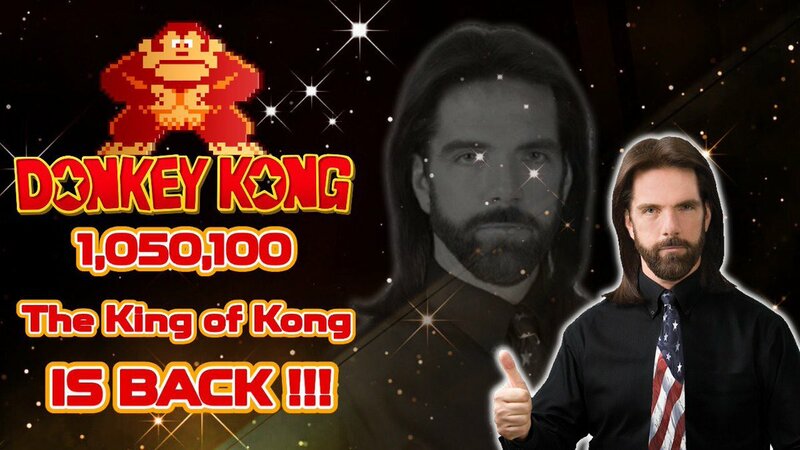 As many of you know, there’s been an ongoing saga over Billy Mitchell’s supposed high score in Donkey Kong. Twin Galaxies handed down its verdict today, stripping Mitchell of his scores in Donkey Kong as well as other games. Additionally, he’s been banned from submitting scores to Twin Galaxies – a significant blow as it’s the world’s largest tracker of gaming records. Twin Galaxies ultimately determined that Mitchell’s high score of 1,047,200 was not earned on an arcade machine. Instead, it’s believed that he achieved the record through emulation software. Steve Wiebe is now said to be the first official million point record holder following today’s news. 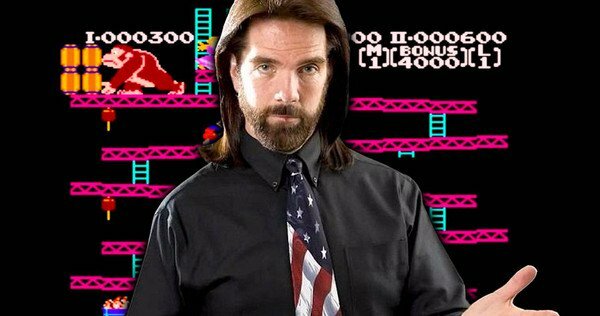 Billy Mitchell, a prominent member of the Donkey Kong arcade scene, was recently accused of obtaining high scores on the emulator MAME. This is significant since it was expected that he had playing on original arcade hardware. Billy Mitchell has made a name for himself in the arcade scene over the years, especially when it comes to setting high records in Donkey Kong. Yet now Mitchell is coming under fire after being accused of cheating. After looking into the situation, a Donkey Kong fansite has removed three of Mitchell’s high score submissions. The site believes the community was misled about playing on real arcade hardware. It’s thought that, instead, emulator gameplay was used. The World Video Game Hall of Fame in its 2017 edition has inducted four new games that deserve it because of how they affected the video game industry: Donkey Kong, Halo: Combat Evolved, Pokémon Red & Green, and Street Fighter II. 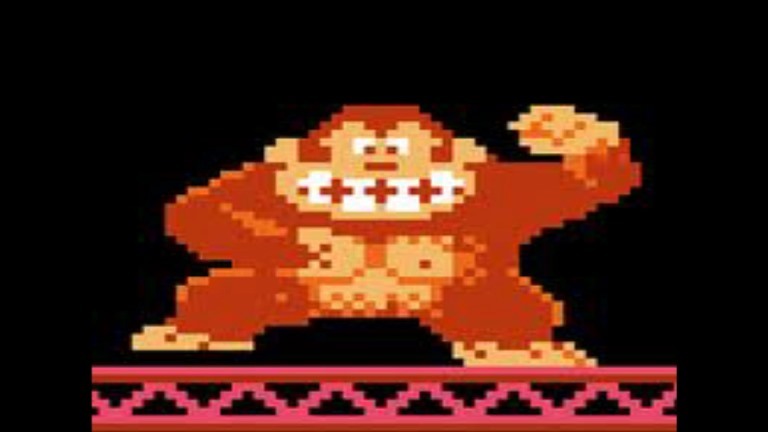 The original Donkey Kong arcade game has been inducted because of how it helped to launch the career of one Shigeru Miyamoto, as well as counting as the first appearance of characters Donkey Kong and Super Mario (who was known as Jumpman). A couple of weeks ago, Nintendo published two interviews with Shigeru Miyamoto and Yoshio Sakamoto on their Japanese website. Miyamoto, obviously, created Donkey Kong, and Sakamoto developed Balloon Fight. Both of these NES games are among the games lineup of the NES Classic Mini, which was the occasion for these interviews. Now, Nintendo of America has provided an official translation of both interviews on their website. 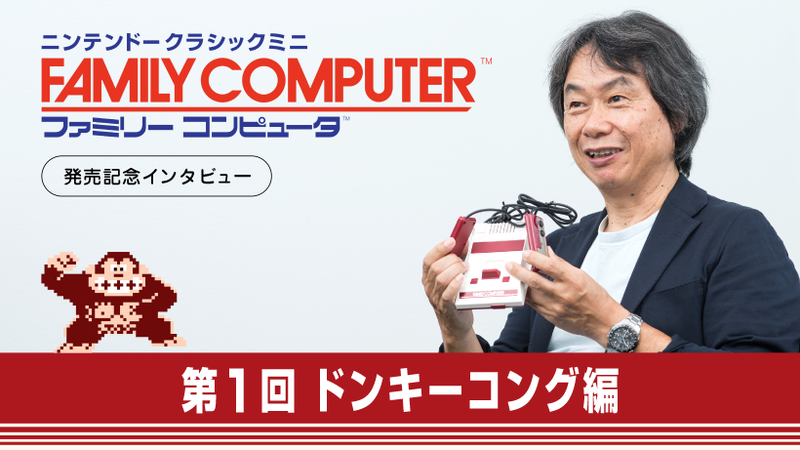 We’ve already provided an overview of the Miyamoto interview here, but it if you want to check out the official translation, you can find it here. The Sakamoto interview about Balloon Fight is located here. 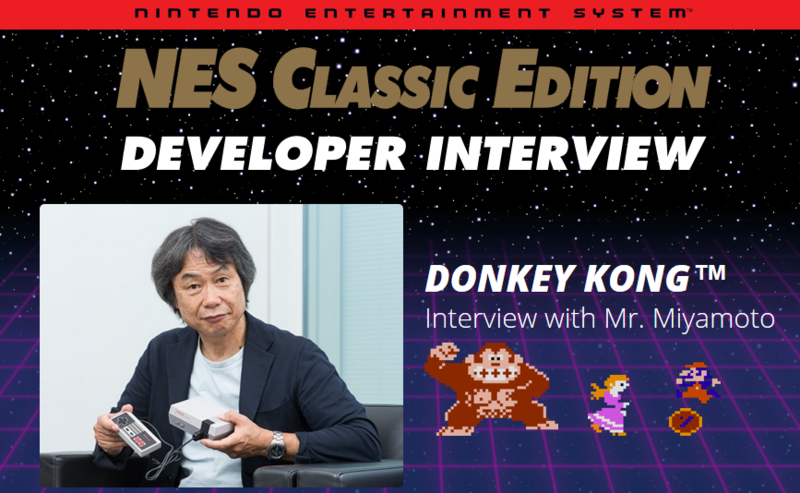 Earlier today, Nintendo published a new interview with Shigeru Miyamoto about Donkey Kong on its Japanese website. It was conducted in celebration of the NES Classic Edition/Famicom Mini due out on the market next month. To say that the interview was interesting would be an understatement. It’s unfortunately Japanese-only right out, but Wired has provided a pretty good rundown of what was talked about. Miyamoto revealed how Nintendo’s company bathtub helped soothe his thoughts, working with Nintendo of America and pushed for Donkey Kong’s name, how he tried conveying that Mario was in his 20s, and more. Head past the break for a summary of Wired’s article. We encourage you to read their full piece here as well.